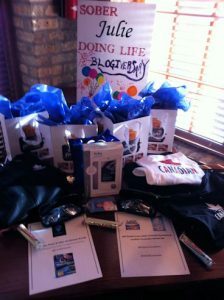 This past December Sober Julie Doing Life celebrated it’s 1st Blogiversary. 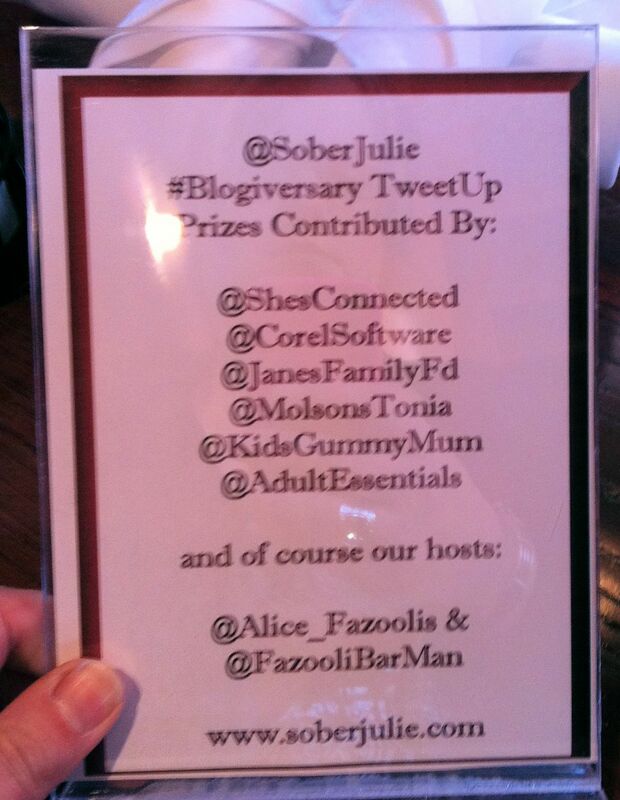 As a final hurrah on December 3rd I held a #Blogiversary TweetUp for any and all of my blogging friends who could attend. I began planning this on short notice and I was so grateful when Alice Fazooli’s in Vaughan kindly offered to host the event!!! 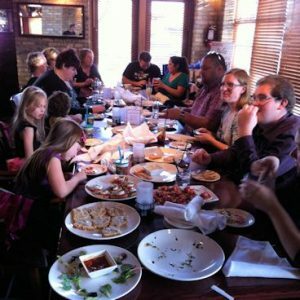 This was truly a big deal, have you ever been to Alice Fazooli’s?? The atmosphere is beautiful and the food is to-die-for!!!! Arriving on the day of the event I was met by Christian, who is an amazing gentleman to work with! He truly made throwing an event a breeze. You can find Christian on Twitter as @FazooliBarMan. 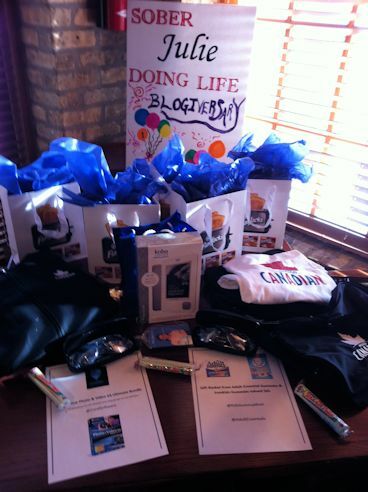 Some wonderful companies jumped on board for the Blogiversary Tweet Up and provided some awesome prizes. I was concerned they wouldn’t fit on one table! As I said, the atmosphere was beautiful, the staff welcoming and the food was delicious and Alice Fazooli’s was so much more generous than I had expected! I was touched by my friends who joined me in celebrating, having children with us all just seemed to round it out properly. 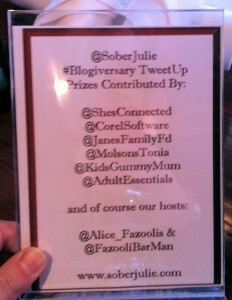 I didn’t manage to get a good shot of all of the people at the Blogiversary but here are a few to give an idea…. 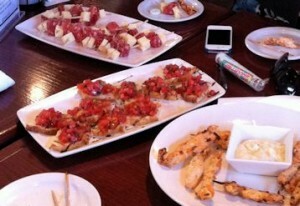 Do you see what I mean about all of that food! In the end I felt we did a fantastic job of partying for a month, there was such a huge showing of support my heart was full. 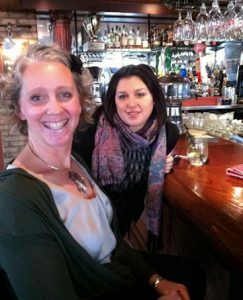 Thank you to everyone who reads my blog……I cannot wait to see what 2012 will bring! Happy Blogiversary to you Julie. Celebrate yourself today and always. I just know 2012 will absolutely kick -ss!! Still sad I missed it :( maybe next year! Great job Julie!! I had a blast, and won a great prize! Your are a super lady and a super friend! Congrats in the big day! How fun! All the best in year two, here at your blog! Great things are happening already. Congrats Julie! Looks like it was a lot of fun! Wish I was closer and could have attended. Looks like you all had a blast. I would have loved to go. :) So glad it was such a success love. Looks like a month long party! so fun! 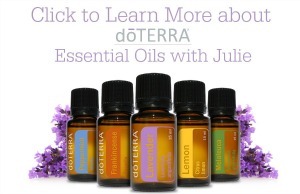 Great job Julie! I completely missed my own blogiversary, lol. Congrats! Looks like a great time. Happy Blogiversary Julie! That’s awesome! That looks like it was a good time! How exciting to celebrate for a whole month! :-) I have an Alice Fazooli’s near me, it’s pretty yummy! What a fantastic way to celebrate your first year. Year #2 is going to be huge for you! I’m with Julia, year 2 is gonna be AWESOME!!!! congrats! !